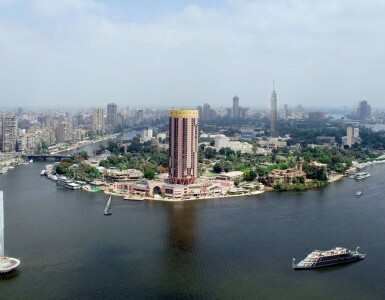 Welcome to a 5-star luxury hotel on the Nile: a haven in the center of Cairo where you are made to feel at home. Discover 433 luxurious rooms including 50 sumptuous suites, a stunning ballroom perfect for weddings, and flexible meeting rooms. Wander down the leafy Promenade to exquisite restaurants and bars, pamper yourself in SoSPA, and soak in an infinity pool overlooking the Nile. The excitement and mysteries of Egypt’s capital lie steps from the light-flooded lobby. A vast chandelier glitters in the lobby, sprinkling light into a magnificent space designed by Pierre-Yves Rochon. During the day, sunlight floods through an immense window, like a living picture of the Nile. Parisian elegance blends with Art Deco and Egyptian features: subtle lotus flowers bloom as you ascend a spiral staircase, and ibis carvings, suggestive of hieroglyphs, transport you to forgotten pyramids. Grand yet welcoming, the lobby offers a taste of what is to come.